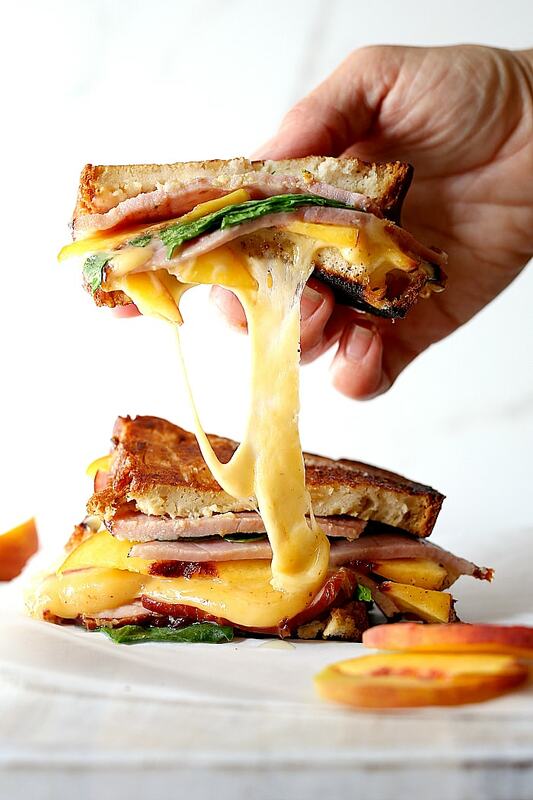 Gourmet grilled cheese sandwich oozing with melted Gouda cheese and thick ham slices nestled between two buttery gluten-free slices of bread. 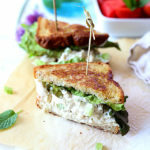 This adult-style cheese sandwich can be made on the skillet or grilled outdoors! This is a sponsored post from Frick’s Meat written on behalf of me. All opinions are mine and I only support products I love and use myself. 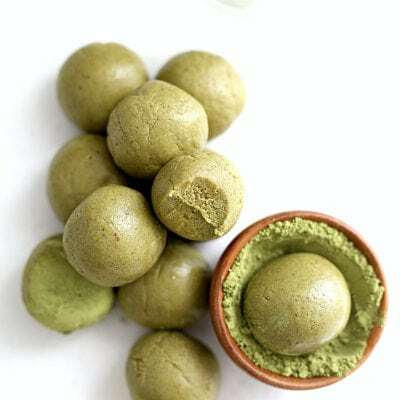 What is your favorite food you loved to eat as a kid? Take a moment and think about it real hard. Anyone’s ears perking up when I mention mac ‘n’ cheese, grilled cheese, chicken tenders, ham and cheese sandwiches, peanut butter and jelly sandwiches – do those ring a bell? Funny enough they still are some of our favorite foods to eat even in “ADULTHOOD”! 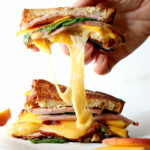 Y’all can thank me later, but I have taken your favorite childhood traditional grilled cheese sandwich up about 10 notches into a gourmet grilled cheese sandwich smothered with mustard and butter then stuffed with thick slices of ham, fresh peaches and spinach that outflows with melted Gouda cheese! 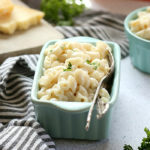 This might not be one of the healthier recipes on the blog with all the cheese and butter, but this one sure is delicious! Everything in moderation, right? 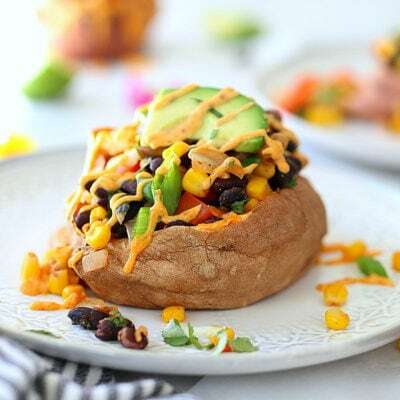 It is ok to enjoy your childhood favorites every once in a while, especially when you add extra protein, fruits and vegetables inside (IMO) – like this one! The framework – First let’s start with the structure that holds the whole sandwich together. That would be two slices gluten-free bread (if you are not here for gluten-free go ahead and use your favorite bread!). Butter the bread to add flavor and prevent sticking while it heats. 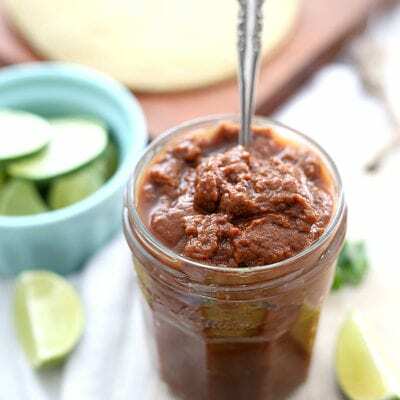 Sauces and spreads – Add Dijon mustard for a little bit of zesty flavor in the grilled cheese. 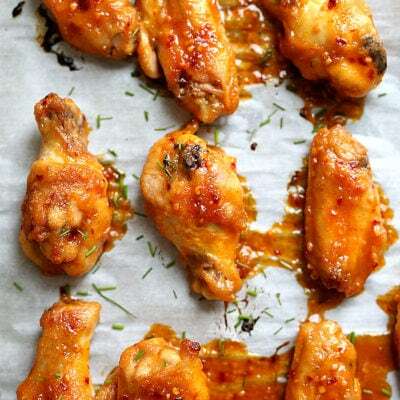 If you want a little extra kick, dab a few dots of hot sauce with the spreads. The bulk of the sandwich – 2 slices of thick ham, Sliced and 2 slices of Gouda cheese. Fiber and nutrients (aka fruits and vegetables!) 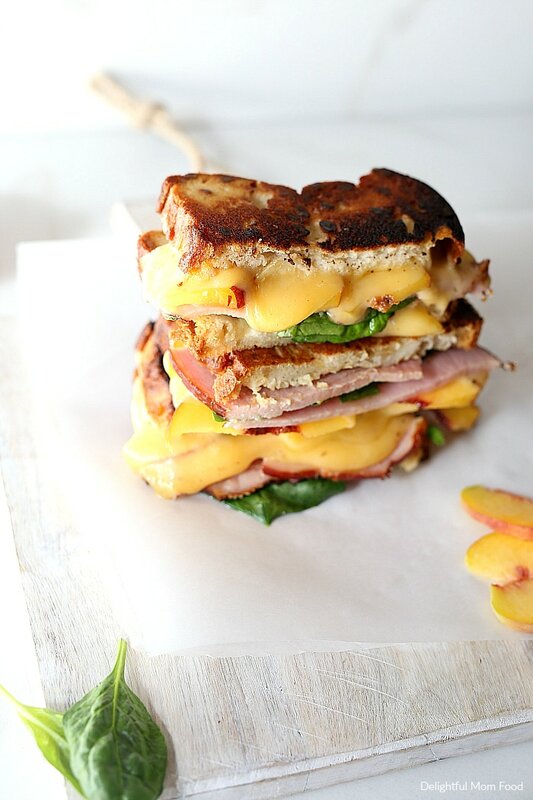 – For this gourmet grilled cheese, I use thinly sliced peaches and fresh green spinach leaves. Feel free to use more of your favorite fruits such as apple or pear slices as they pair well with ham. Add this layer after the grilled cheese is already cooked and the cheese is melted, otherwise it will wilt the spinach and make the peaches mushy. Preheat skillet over medium heat. Generously add ghee or organic butter to one side of both slices of bread. On one of the bread slices, add mustard or any spreads to the opposite side of the butter. Place the bread butter-side-down onto skillet bottom and add 2 ham slices (over the mustard side) and 2 slices of Gouda cheese. Place the other slice of bread that is already buttered on top, with the butter-side-up. Grill until lightly browned and with a large spatula, carefully flip over to brown the other side. Flip over again if the cheese has not yet melted. Carefully remove from the skillet and open the sandwich to layer peaches and spinach inside. Close the sandwich and serve (it is easier to add the fruit and veggies on the ham side). Preheat grill until hot or on medium heat. 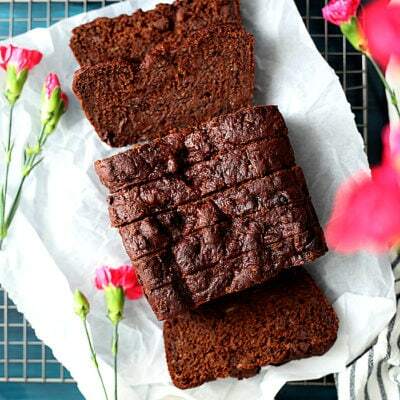 Generously add ghee or organic butter to one side of both slices of bread. Add mustard or any spreads to the opposite side of the butter on one of the slices. Place the two slices of bread butter-side-down on the grill. Add 2 ham slices to the mustard half and 2 slices of Gouda cheese to the other half. Grill until the cheese has melted, about two minutes. Remove sandwich halves from grill. Add the peaches and spinach then put the sandwich halves together, and serve. 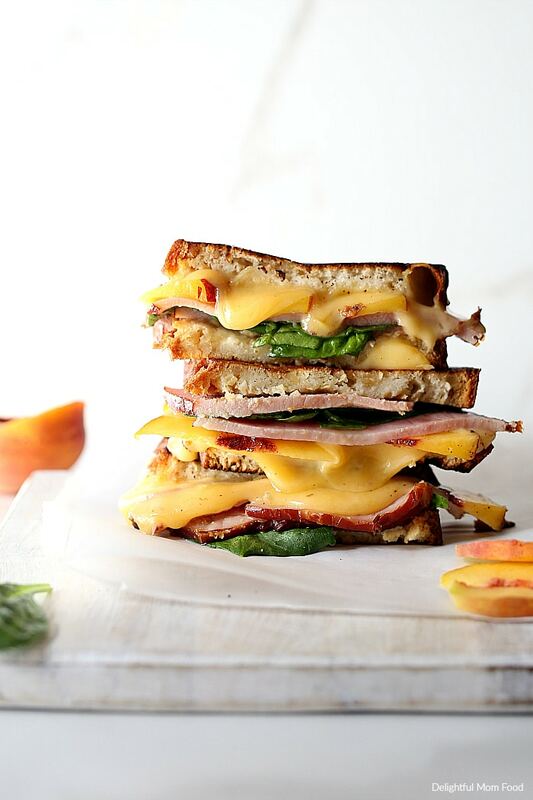 The result is finger-lickin’ melt in your mouth gourmet grilled ham and cheese sandwich! Now it is your turn! What is your favorite combinations of grilled cheese? So far, this one checks out with my entire family adding mouthwatering ham inside. 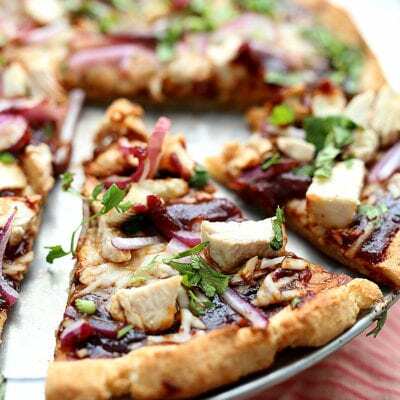 Ham is one of those foods we rarely eat but when we do we prefer thick gourmet slices. You know, those ones you get served in fancy restaurants and gourmet deli’s that do not skimp on their meat in sandwiches. They serve theirs stacked thick and tall with lots of good meat! 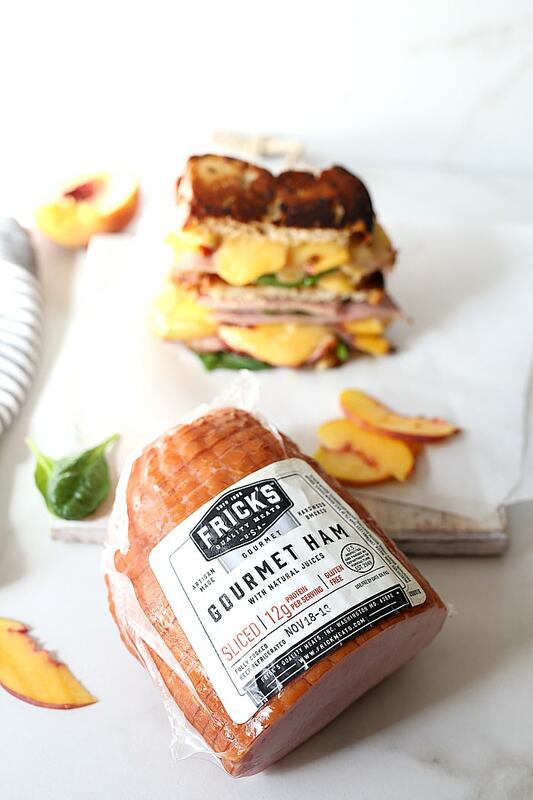 Now you can eat that fancy sandwich in the comfort of your own home with Frick’s Meats (yes, I sound like an ad, but we really love the flavor!) I am excited to share their food with you because it one of the best hams we have ever had. Frick’s is a five generation business using the finest quality of meat and ingredients. They use nothing but quality cuts, real cane sugar, and it’s smoked slowly over embers fed by fragrant hardwoods such as hickory, apple and cherry. Thank you Frick’s Meat for sponsoring this post. Don’t forget to check out their website here and follow them on Facebook and Instagram. Happy grilling friends because #itsfrickingood! Preheat skillet over medium heat. Spread 2-3 teaspoons of ghee or organic butter to one side of both slices of bread (depends on bread size). On one of the slices, add Dijon mustard on the opposite side of the buttered side. Place the mustard slice of bread butter-side-down onto the skillet bottom and add 2 ham slices and 2 slices of Gouda cheese. Place the other slice of bread that is already buttered on top, with the butter-side-up. Grill until lightly browned and with a large spatula, carefully flip over to brown the other side. Flip over again if the cheese has not yet melted. Carefully remove from the skillet and open the sandwich, placing peaches and spinach inside (may be easier on the ham side). Preheat grill until hot or on medium heat. Generously add ghee or organic butter to one side of both slices of bread. On one of the slices, add 2-3 teaspoons Dijon mustard to the opposite side of the buttered side. Place the two slices of bread butter-side-down on the grill. Add 2 ham slices to the mustard half and 2 slices of Gouda cheese to the other half. Grill until the cheese has melted, about two minutes. Remove sandwich halves from grill. Add the peaches and spinach then put the sandwich halves together, and serve.